Bestselling author Jack Canfield shows anyone how to make their unique mark on the world (literally) with this transformative coloring book based on the blockbuster bestseller The Success Principles. Since its publication a decade ago, Canfield's guide has helped catapult hundreds of thousands of people to success. With adult coloring taking the world by storm, Canfield has expertly distilled 30 of his key tenets from his Success Principles book and combined them with inspiring coloring designs to engage the mind and unlock our unique blueprint for personal prosperity. The Power of Positive Inking combines stunning original art from acclaimed illustrator Judy Clement Wall and pairs it with 30 of the most empowering principles. The result? An engaging way for visual, kinesthetic, and left-brain learners to envision their dreams, adopt new mind-sets and behaviors, and achieve their goals. High-quality paper for all types of markers, plus perforated pages that enable you to display your finished pieces as visual reminders in your home or office. Whether you are looking to change careers, elevate your earning power, or find a new passion in your life, The Power of Positive Inking will not only keep you on track to achieve your goals but will help you draw your own unique pathways to success. Live boldly and bring your dreams to life in full color! All of us have aspirations and dreams—passions that fuel our souls and make us come alive. Yours might include an exciting new career path, an exotic bucket list adventure, greater financial prosperity, more loving relationships, or a health-related milestone. Whatever your dreams, you absolutely have the power to make them come true. We are all born with gifts; the qualities unique to us that make us special. More often than not, we fail to see our greatness, or the light that shined so brightly when we were young gets dulled by time or circumstance. As adults, we face deadlines and demands, mortgages and missteps, criticism and conflict. It's easy to get off course and even harder to get back on track. Consider this book a creative compass to help guide you to greatness by discovering some key principles of how to live a life of authenticity, abundance, and joy. Coloring in and of itself is a way to unplug and unwind. When we free ourselves from our digital devices, we can tap into our creative devices, which are just as powerful. As the stresses of life melt away, we can relax into a state of mindfulness or flow where new ideas are ready to be tapped. We are free to create, filling the space with our positive intentions, desires, and dreams. Read each affirmation out loud, allowing them to fill your mind and heart as you go about your day. I believe in the timeless truth that what you think about comes about; that what you focus on expands. Focus on the positive messages as you color and then apply those thoughts as you make positive changes in your life each day. Repetition is key. Each time you reflect on a message, you are literally 're-minding' yourself of your intentions. Envision the ideal picture of your life coming into focus and then take inspired actions to make it come true. You are the designer of your life—the creator of your future. Each morning is a blank canvas waiting for your own unique mark. Fueled by your own creative fire, you can make each day a masterpiece. It's your world—go forth and color it boldly! I salute you, I congratulate you, and I welcome you on an exciting journey of possibilities. You can use any color combination to make a gorgeous piece of art—the possibilities are as endless as your imagination. Use several colors that are close together on the color wheel or choose colors that are opposite on the wheel. The primary colors—red, yellow, and blue—are denoted by a 'P' on the outside of the color wheel. Primary colors cannot be created by mixing any other colors. The secondary colors—green, orange, and purple—are shown by an 'S' on the color wheel. These are formed by mixing the primary colors. Yellow-orange, red-orange, red-purple, blue-purple, blue-green, and yellow-green make up the tertiary colors, which are noted with a 'T' on the outside of the wheel. These colors are formed by mixing a primary color with a secondary color. Judy Clement Wall is the author/illustrator of the creative self-love journal, Find Your Awesome. She is the illustrator of several coloring books for adults including, Inkspirations for Women, Inkspirations for Recovery, and Inkspirations Mindful Living. Judy is dedicated to exploring the intersection of fearless love and wild creativity. To see more of her art and read her published work, visit her web site: www.judyclementwall.com. You may notice there are several mandalas in this book. The word 'mandala' means sacred circle in Sanskrit. Since ancient times, holy people from around the world have used mandalas as a way of evoking spiritual energy and healing. Mandalas symbolize wholeness, unity, and the circle of life. The psychiatrist Carl Jung used mandalas as a healing tool, and research has shown that creating and coloring mandalas can relieve stress. There are countless ways to customize a mandala to be your own unique creation—from the colors you choose to adding decorative backgrounds or even a meaningful phrase, goal, or favorite quote. Here are some examples of how different people colored the same mandala to reflect what is important to them. Just as no two people are alike, no two designs will be the same. As in life and in art, we each bring our own style and personality to everything we touch. Use the art that follows on the next pages as a launch pad for your creativity as you bring your unique dreams to life. ©2017 HCI Books. All rights reserved. 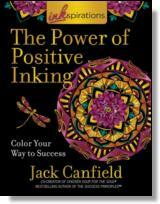 Reprinted from Inkspirations The Power of Positive Inking: Color Your Way to Success. No part of this publication may be reproduced, stored in a retrieval system or transmitted in any form or by any means, without the written permission of the publisher. Publisher: Health Communications, Inc., 3201 SW 15th Street, Deerfield Beach, FL 33442.